A collaboration, including researchers from Juntendo University, Japan, demonstrate differentiation from stem cells into specialised cells thought to be the most important therapeutic target for the treatment of hereditary deafness. The findings are published in Stem Cell Reports, 11 Nov. 2016. Schematic of the culture of connexin 26 expressing gap junction plaque forming cells and the recapitulation of disease symptoms in cells cultured from connexion deficient mice. It is expected, then, that these iPS derived cells, which can be obtained from patients, will be particularly useful for drug screening and inner-ear cell therapies targeting GJB2-related hearing loss. Embryonic stem cells can differentiate into a several different types of specialised cells to form the range of cells needed in the human body. The ability to differentiate into several different types of cell is described as pluripotency and can be induced in adult cells as well by reprogramming non-reproductive system cells (somatic cells) to produce “induced pluripotent stem cells”. Connexins 26 and 30 form gap junctions that facilitate the movement of ions needed to maintain a balance in conditions - homeostasis – as well as developmental organization in the cochlea. 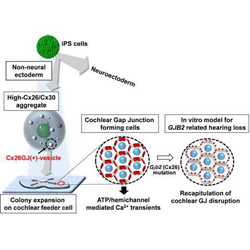 The researchers were able to demonstrate that their stem-cell-derived gap junction cells were functional for forming gap junction intercellular communication networks typical of the developing cochlea. The cells differentiated from mice that were deficient in connexin 26 demonstrated a disruption in the formation of gap junction plaques. Kamiya1, In vitro models of GJB2-related hearing loss recapitulate Ca2+ transients via a gap junction characteristic of developing cochlea, Stem Cell Reports, Published online 11 Nov. 2016. The mission of Juntendo University is to strive for advances in society through education, research, and healthcare, guided by the motto “Jin – I exist as you exist” and the principle of “Fudan Zenshin - Continuously Moving Forward”. The spirit of “Jin”, which is the ideal of all those who gather at Juntendo University, entails being kind and considerate of others. The principle of “Fudan Zenshin” conveys the belief of the founders that education and research activities will only flourish in an environment of free competition. Our academic environment enables us to educate outstanding students to become healthcare professionals patients can believe in, scientists capable of innovative discoveries and inventions, and global citizens ready to serve society. Juntendo was originally founded in 1838 as a Dutch School of Medicine at a time when Western medical education was not yet embedded as a normal part of Japanese society. With the creation of Juntendo, the founders hoped to create a place where people could come together with the shared goal of helping society through the powers of medical education and practices. Their aspirations led to the establishment of Juntendo Hospital, the first private hospital in Japan. Through the years the institution’s experience and perspective as an institution of higher education and a place of clinical practice has enabled Juntendo University to play an integral role in the shaping of Japanese medical education and practices. Along the way the focus of the institution has also expanded, now consisting of four undergraduate programs and three graduate programs, the university specializes in the fields of health and sports science and nursing health care and sciences, as well as medicine. Today, Juntendo University continues to pursue innovative approaches to international level education and research with the goal of applying the results to society.